Serving a sales territory covering Michigan, Indiana, Ohio, Kentucky, Tennessee, CSI offers a great selection of equipment, experienced technical and sales support. With over 200 years of combined Outdoor Power Equipment experience. I was blown away at how fast the mower mowed my tall grass! Not a change in the sound of the engine: I came into the house with a grin on my face and told my wife about it! ... Thank you! I would like to say thank you for addressing my customer concerns. The service rep that came to my home was professional and very knowledgeable. It was like visiting with an old friend. With this type of customer service, I'm completely satisfied and confident with my Country Clipper purchase. "Awesome!" The joystick control gives the operator precision control. The 27 hp Kohler has loads of power. I have mown three-foot tall grass . . . no sweat. The low center of gravity and articulating front axle make it incredibly stable on hills and ditch banks. Just wanted to let you know how pleased I am with this product . 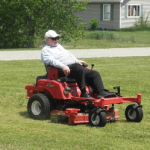 . . as comfortable as mowing from an easy chair. I thought you might enjoy the fact that I have in my proud possession one of your original mowers that is now 25 years old! I bought it from an older man from Topeka, and it is in remarkable condition, right down to the original engine, and upholstery. Thanks for building such a great mower . . . it has exceeded all of my expectations!!!! Bob Here... 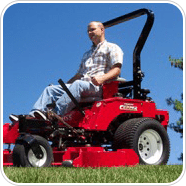 I have been wanting to share with those who might be interested in purchasing a new Zero Turn Mower ! I'm very blessed to have one that I purchased new back in 2013 from our dear friend in Wabash, IN who has a Country Clipper Zero Turn Mower business. God is so good to give us such wonderful friends as Ken & Ann Miller !! 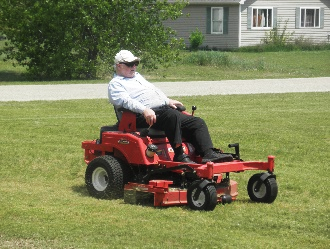 This particular brand (Country Clipper) has Joystick Steering & as you can see, I look like I'm riding in my lounge chair, mowing lawn. This feature (Joystick ) is a great benefit for me at my age now for my hands will not let me grab onto a handle bar type Zero Turn Mower. There are too many other quality features of this mower to mention them all here !! Just one to mention is unbelievable- no wheel tracking patterns when you're done mowing & exceptional even mowing pattern! I trust that this may be of help if you are thinking of a Zero Turn Mower !!! A big thanks to our dear brother in the Lord Ken & his kindness so I could live out my mowing days in comfort & style !!! HAPPY SUMMER TIME MOWING !!! Purchased from Grain Systems, Inc.
Just wanted to tell you how much "I LOVE" my Boss. Just purchased it in early June and have mowed many times. The suspension ride seat is awesome. When I get done mowing my 2 acres, I am able to get off using the hand rail and front step with ease. With my old tractor I could hardly straighten up after bouncing around for almost 2hrs. Now I ride in comfort for 5 hrs. Your dealer in Greenville OH "Triple H" gave me an awesome deal I couldn't pass up. All my neighbor's couldn't figure out how I steer my Zero turn without two leavers. I recommend Country Clipper to everyone.